Have you ever pulled up in a black benz and left in a white one ? We might want to ask J Hus how that feels. Some months ago, I stumbled on this tweet, it resonated deeply, and the number of retweets and likes show that many people agree and can relate to that mindset. I am quite certain that If we used Lolu’s profile to create a market segment for Uber users based on demographic segmentation variables such as age, gender, family size, income and occupation, with the sample space as those who liked and retweet his tweet. We would definitely find a large market segment because of correlations in variables but context and causation would be missing. Context and causation would let us understand why Lolu would use an Uber when it is obvious that he owns a car because he knows all of the consequences of owning one; easy mobility, the social status, maintenance, the visits to the car wash and the mechanic etc. If we analyze this, we begin to understand the mindset of a consumer and what they really want in different circumstances is more important than their demographic profile. It is clear that in some instances Lolu wants to stunt on others, and would not be able to do so to the degree he wants if he was using his car, it is also clear that in some instances he does not want the baggage that comes with owning a car when all he is trying to achieve is mobility. We can identify two different motivations, one is emotional and the other is functional. In his book Competing Against Luck, Professor Clayton of Harvard Business School speaks about “The Jobs to be done” framework which helps to understand customer motivations in business settings. The framework identifies that customers rarely make buying decisions based on what others in their market segment do but because they have a problem they would like to solve. 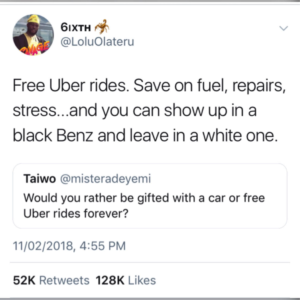 Take Lolu for instance, He would take an Uber not because he is a Male in his mid twenties, lives on the island in Lagos but because he does not want to spend more on fuel, he does not want to visit the mechanic, he does not want the stress that comes with driving in Lagos traffic and finally he wants to show up in a black Benz and leave in a white one like J Hus. Knowing the job customers want to get done defines how you create value propositions and products for them. It defines if a company see its self as an manufacturer of automobiles or a transportation company. 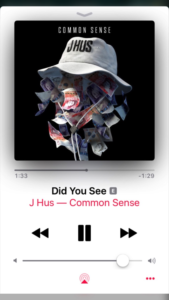 On the song “Did you see” by JHus, he brags on the hook saying “Did you see what I done? Came in a black Benz, left in a white one“. It’s evident that the job to be done in this context was not functional, it was purely emotional and social as JHus was very interested in knowing if we had seen what he had done, how he arrived and how he left. The question for all entrepreneurs and innovators out there is “Did you see?” Did you see through the demographic variables what your customer was trying to achieve when she hired that product? Did you see?